It is funny how Spirit works. It just is God’s grace and pays no attention to the small self attempting to control and make sense of the inexplicable. I’ve received this lesson over and over again. I experience a transforming moment of pure awareness and then the “I” takes over and tries to control the outcome—to manage God’s plan, as if God does not know what to do. Even the spiritual ego can see the humor in this. Nevertheless, I choose more often than not to get confused about the difference between God’s plan and my plan. I’m a re-covering serial organizer. I can get totally baffled by people that can’t seem to do the simplest of tasks. So I complicate this idea that I need do nothing except Trust God’s plan. Planning and organizing a retreat in Abiquiu, NM called “Freedom through Relationship” demonstrated in very clear ways the difference between trusting God’s plan and thinking I’m following God’s plan. This is how it went, I had this profound awakening to the energy of Mother Mary and a deep knowing of my purpose and calling in union with God to teach about holy relationships. Then I decided that because of this deep awareness, God must expect me to once again organize and lead workshops. So I called on my organizer self and planned a retreat. After all, this is something I know how to do. When I bothered to listen to the still small voice within, I did hear that when I was ready more would be revealed about this calling to the way of Mother Mary. I told myself, I’d have it figured out in a year so that’s when I planned the retreat and then convinced myself this was God’s plan. Of course it wasn’t, it was my plan trying to control the outcome. The result, no one signed up for the retreat as of the end of the early-bird registration in January. Yet, it has been a very healing year full of God’s grace. Therefore by the time I arrived at this point of writing that I am canceling the retreat, I feel nothing but peace and love for the process and great gratitude for the excavation of some deeply held limiting beliefs that have now been healed. A clear indicator that this was my plan and not God’s was how much worrying I did that if I didn’t do this or post here or utilized all the social media available it will be my fault if it does not happen. And I justified all of the anxiety by the idea that I now knew my true calling and purpose in union with God, therefore anything I did to further this has to have God’s blessing. How easily the spiritual ego takes over. To paraphrase A Course in Miracles (ACIM), a healed mind does not plan, it carries out the plans it receives from listening to Spirit/its Holy Self. A healed mind waits until it’s been taught what to do, and then proceeds with the certainty that nothing can stop the accomplishment of any goal that serves God’s plan, which is always for the highest good of everyone. “Waits” for me is the key word here, for impatience is a hallmark of my resistance to God. Patience is Trust and means waiting to hear clearly the voice of Love, allowing the process, and trusting completely in God, my Christ Self. Knowing without a doubt that I hold within the peace that passes all understanding and therefore when the time is right, I’ll know what to do. And with that knowing comes joy in serving God. So I’m waiting with gratitude for God’s plan through the way of Mother Mary to continue to be revealed. In fact, it is always unfolding perfectly for God’s presence never leaves us, we can only choose to ignore it. Spirit is always perfect and therefore does not require correction. This experience with the retreat coinciding with the guidance to resign as President of Take Me to Truth, Inc (TMTT) unfolded perfectly to bring to the Light of healing many deeply held fears and judgments. 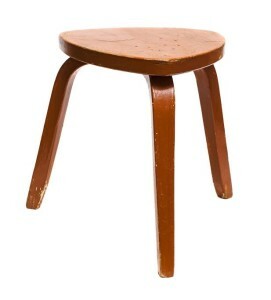 How does this connect to the image of the three-legged stool? During my time on the board of TMTT and working closely with Nouk Sanchez, I received a vision of a three-legged stool as a symbol of what I would teach. I came to understand that each leg of the three-legged stool represents one of the three major teaching courses of the way of Jesus: A Course in Miracles, A Course of Love, and The Way of Mastery. These three courses provide a rock solid foundation for Jesus’ teachings and thus a return to Christ Consciousness. The image can also be used for the trinity: the mother/father, the daughter/son and the Holy Spirit/Holy Self. All three are joined together as one and without one leg, the stool tips. The symbolism resounds deeply within the heart. In union with God, differences are reflections of the vastness and infinite variety of God’s love. In the egoic dream, differences are used to support the illusion of separation. At the time I received this vision, I was reading The Way of Mastery and finding it immensely helpful in teaching Jesus’ path to atonement in ways that I had not understood through ACIM. Because I thought I would always be with TMTT, I concluded that the image of the three-legged stool was also for TMTT. It is only now after reading A Course of Love (ACOL) and thus being guided to the way of Mother Mary, and leaving TMTT that I more completely understand the symbolism of the three-legged stool in my life. I find it comforting in many ways that I received the image of the three-legged stool because it merges much of what I used to teach in my past professional career with what is happening now. To state it as succinctly as I can, I taught that children are not the labels we give them and that we all learn and process information in many ways. Understandably Jesus knows this and has provided three courses that utilize the different ways we learn: the mind, the heart, and the body. It’s brilliant. It all comes together in wholeheartedness and the embodiment of Christ Consciousness. The reading of ACOL also helped in the awareness that I was to leave TMTT in order to dismantle some deeply held limiting beliefs so as to be more open to hearing God’s voice and what is coming. I realized I no longer needed intermediary relationships to be in Union with God such as: a teacher, Jesus, Mary, the Holy Spirit, and others. Instead I am beginning to expect direct revelations from God. The queendom lies within and thus the choice for love is always there and needs no one to show the way. It just is. Of course this decision to leave the comforting cocoon of TMTT brought up myriads of fear, anger, judgments and feelings of abandonment many of which would show up as aches, severe pain and problems in the body. I’d go within and heal one problem only to have another crop up. It felt as if I was playing whack a mole with my body. I wrote many forgiveness letters and always it came back to one thing, forgive and Love myself. By living as I Am in this world as a daughter of God whose only purpose is to extend God’s love, I create change in the world. So I have a deep knowing what this anchoring of the new means and it does not necessarily include teaching workshops. And, I’m getting better about not choosing the ego as if I need to figure out God’s plan. I also have a greater understanding about what it means to trust God’s plan. It is all unfolding perfectly as I relax into the joy of just being in Union with God. As much as I love the ACOL Facebook group, I’ve not had time to pop by there in weeks. Something told me to click on your “Spirit of the Child” post, and I’m just astonished at the synchronicities I’m finding here. I have been having such an intense dialogue around “Surrender” and “Trust” and waiting on divine timing since the close of “Queen of the Cosmos”, Shiloh Sophia’s 2015 Red Madonna workshop combining painting, poetry and spiritual inquiry around reconnecting with the divine feminine. You cannot imagine how much relief I’m feeling reading this here. Your words here bring such clarity to my own experience, and relieve me of such a burden of feeling guilt, of feeling like a failure because “my efforts” and “my plans” are not “working”. I’ve been feeling like should post more of my Red Madonna work on my Miriam Tree blog, but I haven’t made time for it because I’ve had so much else going on. But as I’m reading your articles here, I’m sensing strongly that it may be time to do so. Finally, because you specifically speak of a new and deep relationship to the Mother Mary, I have to invite you to see what’s happening in the Red Madonna workshop. This year’s theme is “Cathedral of the Heart”, and you can learn a bit more about it on Shiloh’s website, and see if it resonates for you: http://www.shilohsophiastudios.com/red-madonna-2016-cathedral-of-the-heart-dancing-on-the-edge-of-the-circle/. I’m just getting around to responding to the comments to this blog post. We also have not connected by phone, perhaps you did not receive my email about this. Anyway, thanks so much for sending my the link to the Red Madonna. I did want to know more about this. Will you be going to the ACIM conference in April when ACOL students are getting together? If so, let’s talk. What a nice image — the three-legged stool representing ACIM, ACOL, and WOM. Have you also noticed how each of those three great works are also in three parts? ACIM has the Text, the Workbook, and Manual for Teachers. ACOL has The Course, The Treatises, and The Dialogues. WOM has the Way of the Heart, the Way of Transformation, and the Way of Knowing. Jesus seems to like to do things in threes. Well Sally, this is fantastic, you are truly getting in touch with your own Self of Love and Peace without intermediary of any kind! We are all at a crucial point of recognizing what serves us and what doesn’t in this new era of embodying Christ consciousness, you are stating it beautifully in your first newsletter and I am honored to be part of your readers. Thank you for sharing your inner thoughts and I totally resonate with you in your journey of living from the elevated self of form knowing that we are all in this together as we are all One in Light, Peace, Love and Truth (aka God). Namaste and many blessings dear sister.